master maps: Geotagging and Picasa Web Albums API, or was it Google+ Photos? Geotagging and Picasa Web Albums API, or was it Google+ Photos? In my last blog post, I presented a new plugin, Leaflet.Photo, that allows you to display geotagged photos from any source. Among them was Google+ Photos and Picasa Web Albums API. My plan is to use this API for my travel map, and this is why. Does Picasa Web Albums still exist? My public Google+ web album. The album contains both photos and videos. The thing is, there is no Google+ API for photos and videos yet (apparently they were working on it back in 2011). 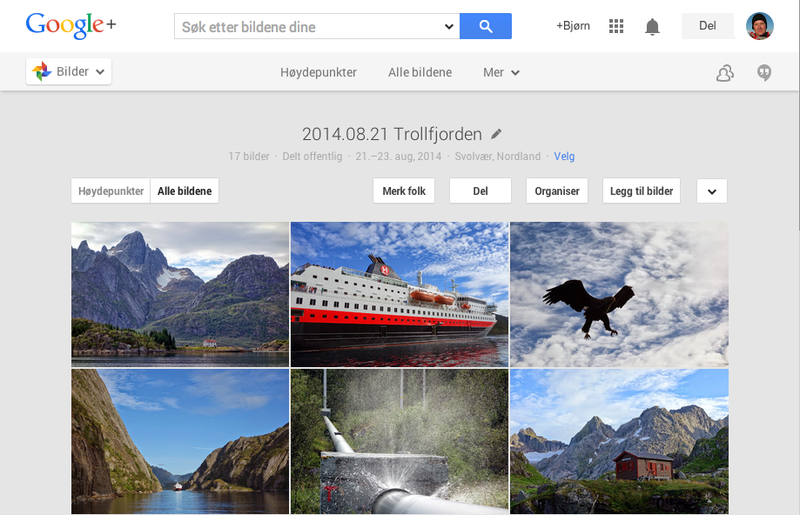 But the Google Web Albums API still works on your Google+ albums. While researching, I also learnt that I could use the imgmax attribute to specify the size of the photos referenced in the photo URL. Neat! So why should I use this (relatively) old API? Compared to other popular social media sites, Google don't strip off the meta information of your photos. Instead it uses the build in support for image metadata extensively. Hopefully Google will continue to do this, although social media sites have reasons not doing so. This means that Google don't lock you in. I can change the location of my photos using my GPS tracks, and it's reflected where I embed my photos. I can edit the image captions in Picasa and it's stored within the image file, allowing me to write the caption once and use it everywhere. So what is my album workflow for my travel map. Before starting my journey, I'm creating a new Google+ album. The feed from this album is attached to my map, by simply passing on the album id. While on journey, I use the Google Photos app to add photos to the album, that will automagically show up on the map as well. Back from trip, I can add and edit photos from my digital camera in Picasa and sync them to the web album. Update 12 September 2015: I'm having trouble uploading images with the Google photos app. The images are geotagged and the location data shows in the Google+ album, but unfortunately the location data is not included in the API feed. Please notify me if you're able to get this to work. Photos from Google+ shown on my travel map. 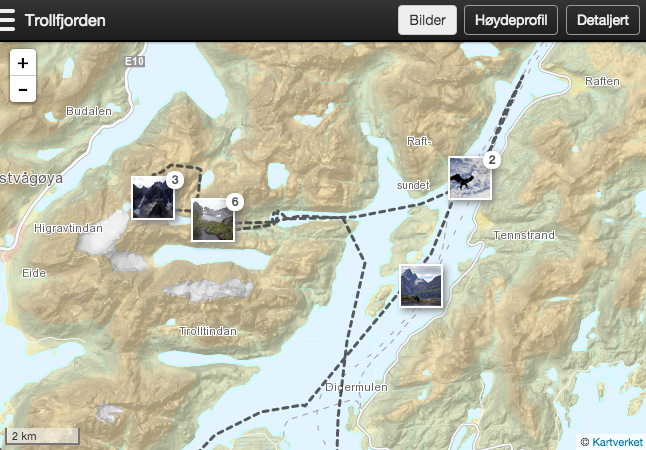 I'm using the flickr API for my photo map: http://map.pascalspoerri.ch and I must say that it works quite well. have you seen Tagger? Little tool from EDINA that allows you to edit th exif info in photos so you can add, or remove location information in images. After having struggled with OpenLayers for a while (and with programming skills limited to HTML 1.0 and advanced BASIC programming in the DOS age), I just discovered how easy it is to create web maps with all kinds of base layers with Leaflet and it's plugins. And when I also discovered your Leaflet.Photo plugin, my search for a decent way to present photos on a map seems to be over! :-) Thanks for sharing! I managed to figure out how to modify the link to a Picasa album which is limited to "people with the link" (had to add &authkey=xxxxx after ?alt=json-in-script at the end of the link). I can live with 512 px photos on a map, but if there is a way to pull out a slightly higher resolution, it would be perfect though. Do You know of any way to specify this in the Picasa link used in the code? Thanks for share this great plugin. I was adapted your code to work with Flickr API. Picasa API is dead for new users to make public albums.